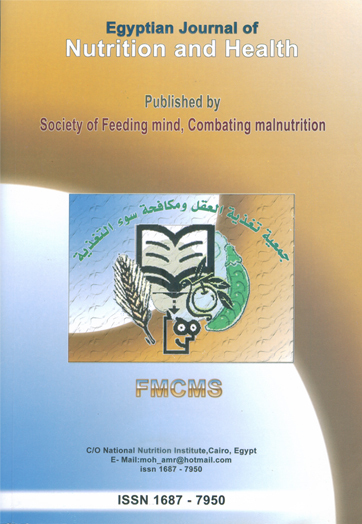 Dalia El-Nahal; Hala Thabet; Sayed F.
Special Food and Nutrition Dep., Food Technology Research Institute, Agric. Res. Center, Giza, Egypt. The study aimed to test the effect of sweet basil extract on hypercholesterolemia. Sweet basil leaves were extracted with distilled water, ethanol and a mixture of distilled water: ethanol (1:3, v/v). Phenolic and flavonoids concentrates were fractionated and identified with High Performance Liquid Chromatograph (HPLC). Two levels of each concentrated extract were used to find its effect on the hypercholesterolemic rats. Six groups of hypercholesterolemic rats received 0.35 or 0.70 g/Kg bw from aqueous, ethanolic and aqueous + ethanolic extracts of sweet basil leaves and were compared with normal control group and hyperlipidemic control group for 30 days. Growth of rats, biochemical biomarks and histopathological examination were evaluated. Results showed that the main phenolic compound was p-Hydroxybenzoic acid. Meanwhile, the main flavonoids compound was rutin. The biological experiment showed that second concentration of sweet basil leaves extracts (ASBL2, ESBL2 and AESBL2) had a positive effect to lower the weight of hypercholesterolemic rats. No significant difference was found in relative organs weight among all tested rat groups. Sweet basil leave extracts had a positive effect to decrease serum triglycerides, total cholesterol, LDL-cholesterol and VLDL-cholesterol of HC rats. The Atherogenic index (Al) was decreased due to sweet basil leaves extracts treated rat groups compared to the hyperlipidemic rats group. Sweet basil leaves extracts may play a role in improving the activity of antioxidant enzymes and decrease the lipid peroxidation (malondialdehyde, MDA) and level of H202 in serum. The serum ALT, AST, ALP and y-GT activities of the second concentration (0.70 g/Kg bw) of sweet basil leaves extracts had no significant difference compared to NC rats group. There was no significant difference in serum uric acid, urea and creatinine among all tested rat groups received sweet basil leaves extracts and NC rats group except for HC rats group. No histopathological changes were observed in liver of rat groups received second concentration (0.70 g/Kg bw) of sweet basil leaves extracts. In conclusion, the obtained results suggest that sweet basil leaves extracts had an important role in lowering the hyperlipidemia in experimental animals especially the second concentration of sweet basil leaves extracts.